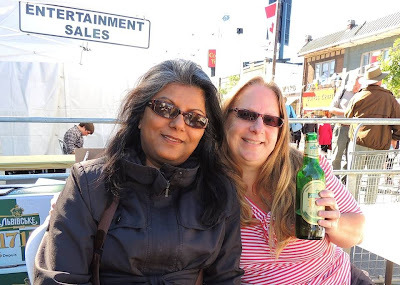 This afternoon Teena and I went to the Toronto Ukrainian Festival in Bloor West Village. Last year Teena was away and I made my first visit to the festival and had a great time. I'm glad that Teena could come along this year. The thing I love most about this festival is how the local people get into it. There are so many men and women walking around in their traditional garb and I'm not talking about the people in booths trying to sell something. He has an eye for the girls! I would have loved to have had some perogies or cabbage rolls but the lines were just too long. We bumped into our friends and and former next door neighbors, Mark and Monica. It was fun catching up with them. Here I am with Mark and Teena with Monica! Although I am not Ukrainian, I enjoy their music and dance. I become a little Ukraine on this day! Great post, than you for sharing. Very nice festival. I've been in Ukraine few years ago. This guys http://touristclub.kiev.ua/ adviced me to visit similar festival, it was awesome.